Six U.S. occupation troops killed in two days... hey george, where are those Iraqi weapons of mass destruction you launched this war over? 1) A U.S. ammunition truck explodes, in this image made from television, after it was attacked in Fallujah, Iraq, Sunday morning Oct. 19, 2003. 2) A U.S. Army ammunition truck burns. 3) Iraqi's dance and one waves a jacket as a U.S Army vehicle burns, in this image made from television. 4) An Iraqi celebrates as an Army ammunition truck blazes. Witnesses said the vehicle had been hit with a rocket propelled grenade in an ambush. 5) Iraqis from the restive town of Falluja watch as a U.S. Army ammunition truck explodes throwing flaming shrapnel. 6) More celebration. 7) Iraqi's celebrate with a burned out rocket while cheering and dancing atop a burned out U.S. Army military ammunition truck after it was attacked. 8) Iraqi youths hold their rifles as they celebrate the ambushing and total destruction of a U.S. Army ammunition convoy. FALLUJAH, Iraq - Two U.S. soldiers were killed and one was wounded in an ambush north of Baghdad, the military said, and insurgents attacked a convoy Sunday in this turbulent city west of the capital, setting off huge explosions in several vehicles. The U.S. command reported no American casualties in the Sunday morning attack against what appeared to be an ammunition truck and two other American vehicles in Fallujah, 35 miles west of Baghdad in the "Sunni Triangle." 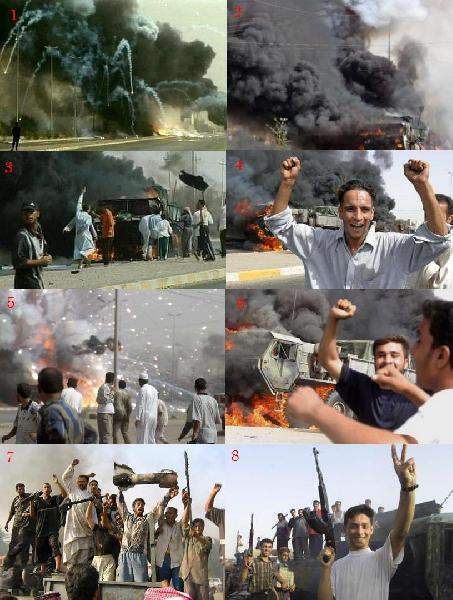 Dozens of Iraqi youths cheered and danced in celebration as contents of the flaming vehicles continued to explode. The crowds scattered when two F-16 jets passed overhead. Witnesses said U.S. troops tried to approach the truck but withdrew after they came under attack with rocket-propelled grenades. "I was fixing my car on the other side of the street, and Americans fired in a circular motion as they attempted to leave the area," 30-year-old Thaer Ibrahim said. At least five Iraqis were wounded when the Americans fired to cover their withdrawal, said Dr. Bassem al-Abdali of the Fallujah General Hospital. U.S. troops and Iraqi police kept journalists away from the scene, but from a distance it appeared that the vehicles, which included a Humvee, were ablaze. There were conflicting reports whether the attack in the eastern end of the city was triggered by a roadside bomb or by rocket-propelled grenades. "Shells were flying everywhere, like fireworks," said Khalil al-Qubaisi, 45, a nearby shopkeeper. In the northern attack, an American mounted patrol was ambushed by rocket-propelled grenades and small arms fire at 10:45 p.m. Saturday outside the northern city of Kirkuk, 159 miles north of Baghdad, said Maj. Josslyn Aberle, spokeswoman for the 4th Infantry Division. The patrol from Task Force Ironhorse — a force that includes the 4th Division — returned fire, but no additional enemy contact followed, Aberle said. In other action in the north early Sunday, U.S. troops were attacked by grenades and small arms and returned fire, killing three Iraqis near Hawija, 150 miles north of Baghdad, the 4th Infantry Division reported. Other American forces detained five attackers north of Beiji, 120 miles north of Baghdad, after a brief firefight. Resistance forces have mounted an average of 22 attacks a day on the U.S. occupation forces in Iraq in recent weeks. Saturday's deaths came barely a day after four American soldiers were killed in a roadside explosion in Baghdad and a clash with Shiite Muslim gunmen in the southern shrine city of Karbala, on the deadliest day for the occupation force in a month.